Achieve more success in business. 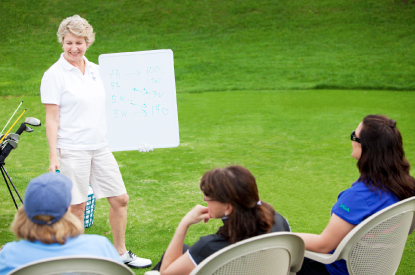 Designed by businesswomen for businesswomen, our programs teach women how to leverage golf as a business tool. At any gathering of women! Perfect for Client Entertainment, Internal women’s groups or interns. Lunch with a brief presentation on De-Bunking the Myths of Business Golf. We’ll come to you, and over a brown bag lunch in your conference room, we’ll introduce women to the game of golf—we’ll show them why it’s important to a woman’s career and explain how, they, too, can learn to play golf and use it as a tool in developing relationships for business. Whether at a women’s leadership conference, at an important client event or as part of your MBA recruitment effort, the message is the same—if you’re a woman in business and want to get to the top, you should avail yourself of all the critical tools—and golf is a critical tool to help women reach their potential. We’ll highlight key sections from our new book, Even Par. How Golf Helps Women Gain the Upper Hand in Business, and you can provide a valuable leave behind that will leave a lasting impression. Want to offer your employees or clients the opportunity to participate in group lessons? This is a great opportunity to build relationships through golf – even before you have enough skills and confidence to get on a course. Plus, lessons take much less time than a round of golf, and can be tucked into your busy schedule or the busy schedule of your clients. Evenings, early mornings, weekends – whatever is convenient for you. Can be sponsored or subsidized by corporations interested in supporting women in their effort to develop this vital skill set. Our most personalized service for those who want to get in the game, but want it tailored to their very specific needs – while traveling for business, at a specific club where they are a member, during off hours. Whatever your needs, we can design a program to help you get in the game. Leslie Andrews teaches at Randall’s Island Golf Center in NYC every Wednesday through Sunday, and at Montauk Downs Golf Course in Montauk, NY every Monday.